The Reserve Bank opened for business in 1934. 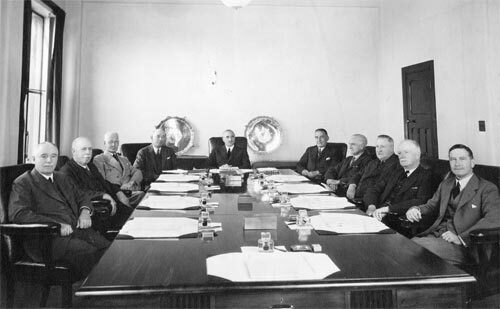 The Reserve Bank Act 1933 provided for a board of directors to manage the bank. The board consisted of a governor, a deputy governor and seven other members. This is the first, or foundation, board of directors, all of whom were appointed by Minister of Finance Gordon Coates. The first governor, Leslie Lefeaux, is at the head of the table. Secretary of the Treasury A. D. Park (to the right of Lefeaux) was a member of the board but could not vote.